Nothing says Halloween like a hand-carved jack-o’-lantern on the front porch. Whether your skills stop at a couple triangles and a squiggly smile, or your carving craftsmanship is the stuff of legends, it all starts with the perfect pumpkin. Visualize your design and choose the perfect pumpkin canvas required to execute it. Traditional, orange field pumpkins come in a variety of shapes and sizes, but you can also carve white pumpkins, winter squash and gourds. Next, set up your carving station. Cover a sturdy table with newspaper. Then, gather serrated and paring knives for carving; a large spoon for scooping out seeds; and paper, pencil and scissors for sketching your design and creating stencils — or go the easy route and use the pumpkin stencil from the October Whiff Box. Gut it: Cut a hole in your pumpkin large enough to remove seeds. Depending on your design, the hole can be around the stem, on the bottom of the pumpkin or anywhere in between. Scoop out the seeds and pumpkin guts with a large spoon or scraping tool. 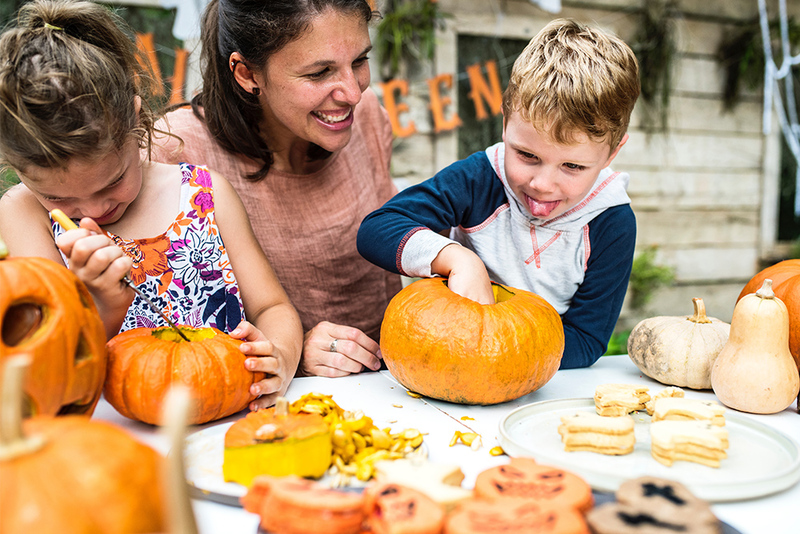 Pro tip: Slather a coat of petroleum jelly or spritz vegetable oil on the inside of your pumpkin to seal in moisture. Prep your design: Tape your design to your pumpkin and use a punching tool to poke holes about ¼ inch apart along the lines of your design. You’ll use these holes as a guide to carve your image. Create your masterpiece: Using a durable serrated knife, saw through your pattern lines using short, back and forth motions. Push out the pieces and trim the edges with a paring knife. Smooth a light coating of petroleum jelly on the cut edges to make your jack-o’-lantern last longer. Clean up: Pumpkin carving is messy. When you’re finished, give all your sealed surfaces a good wipe down with Scentsy Counter Clean. Choose from a variety of fall fragrances to stay in the Halloween spirit. Light it up: Keep it flame-free with an LED light or glow stick inside the carved pumpkin, and proudly display your jack-o’-lantern on the front porch. Remember: Use caution when carving pumpkins. Children should be supervised. And don’t forget to share your masterpiece online! 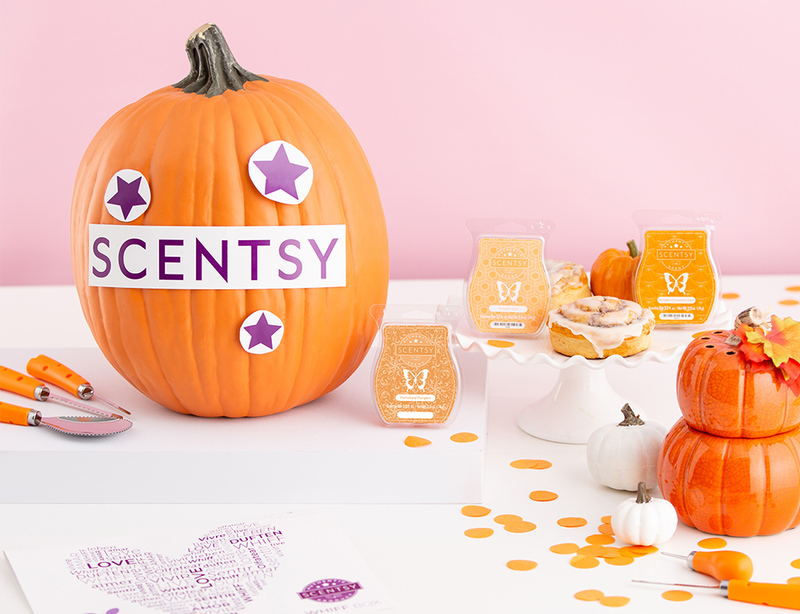 Enter our pumpkin-carving contest on Instagram with #MyScentsyPumpkin for a chance to win some pumpkin goodies. Looking for all things pumpkin this time of year? Contact your Scentsy Consultant to purchase fall products or to schedule a party. Don’t have a Consultant? Find one at scentsy.com. Separator image Posted in DIY, Family, Tips & Tricks.